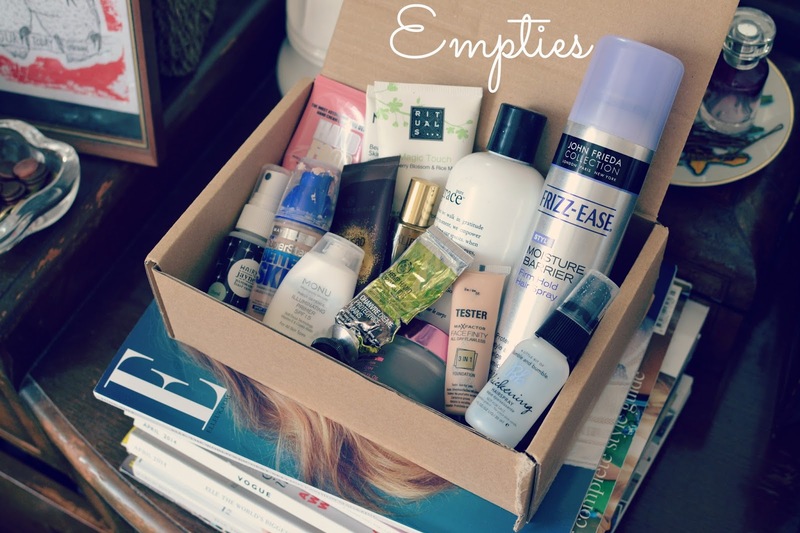 So, my last 'Empties' post was back in March, but I've been making more of an effort to keep up with the 'products I've used up' schtick by actually sorting a box to put all the used-up containers in. (Check me out, proper beauty blogger!) Despite the fact that the box I'm using in an old beauty box container (I'm all about the recycling, and I'm sure SoukSouk would approve!) it's made a huge difference to see the amount of items I've got through building up week on week. I did used to forget what I'd finished up, or absentmindedly throw empty containers out but now that I have a dedicated space to put them, it's been easier to build up a collection! It would stand to reason that if I've used all these items up, I must have really enjoyed using them, which is the case with several of them but I really don't like to waste products so I tend to try and keep using them until they've finished regardless of whether I love them or not, if they don't irritate my skin or anything then I will just stick them out until they're gone (and then make a mental note not to re-buy them!) However the majority of these products I did love, and would rebuy. I've already mentioned the Philosophy product in an empties post before, however I managed to scrape a tiny bit more out of the bottle and I am still loathe to throw it away, this moisturiser is my favourite product ever, I'd go as far to say that if I had to use a single body lotion forever, it would be this one. The scent, the texture, it's perfect, I am going to have to pony up the requisite and eyewatering £30 to buy another one because nothing else is as good, it's terribly annoying that it is so expensive and I might ask for it for my birthday, although that's not until September! If you ever get an opportunity to try this product, take it, you will love it! A couple of the things I got in Glossyboxes such as the Monu primer which I liked but wasn't amazed buy; the packaging is awful and there's probably more product left inside but it is really impossible to get out after the bulk of the contents is finished. The Yves Rocher hand cream was also a Glossybox item but this is amazing, one of the best hand creams I've used, and I've used a LOT. It's also very inexpensive, only about £2/£3 for a tube so I will probably re-buy that. Speaking of handcreams, there are 3 in this empties haul; hand cream is something I use a lot as I suffer with very dry skin on my hands, it's something I really hate but as long as I have a good hand cream I can usually cope with it. The Soap and Glory hand food was part of a birthday gift from some friends, and I really liked this as well as the Body Shop hemp hand protector, which, despite my initial resistance (didn't like the smell at all) is probably my holy grail hand cream; it really does work amazingly well. I've used up this small sized tube but my mum bought me another one which I use pretty much daily. As for my face, I liked this Boots Time Delay night cream which I tried as a replacement to my usual Botanics one and I've enjoyed using this. The No. 7 eye gel was also really good and I have noticed that since I'm not using it, the dark circles under my eyes are more apparent, so I will definitely be getting another one. The Caudaulie divine oil was another Glossybox item and this has been great as a weekly treat for my skin, I was always really unsure about putting oil on to my face but since I've been using this (in small amounts) I can really see a difference in the texture and tone of my skin. Foundation wise, I've reviewed the Maybelline foundation here and would probably (possibly) have re bought it (I didn't adore it, although it was pretty good) until I tried this FaceFinity one by MaxFactor which just totally trumps it in every way. MaxFactor foundations are about £11 so I think come payday I will get a full sized one, at the moment I am finishing off a BB cream which I'm not totally loving but it does eradicate the need to spend out on a new foundation so it will have to do!